Voyager: Ship details and layout. 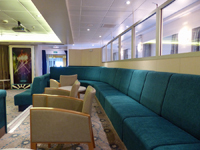 The layout is typical of most cruise ships with cabins on the lower decks, restaurants and lounges on the mid deck (5) and further cabin decks and the lido deck above with the sun deck (8) on top, (deck plans). 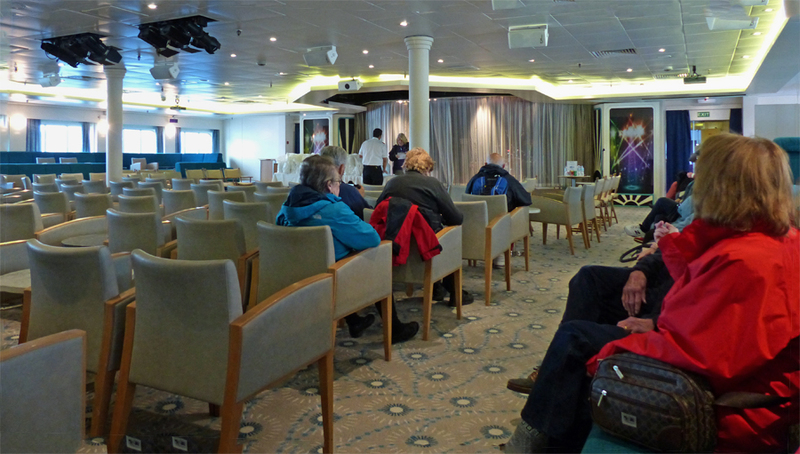 The promenade deck (6) does not wrap right round the ship, but covers two thirds of the length with a large open area at the stern; the sun deck also has a large open area, together these two decks are best for photography and there is plenty of room for everyone. There is a small area at the back of the Verandah restaurant that also has open views. 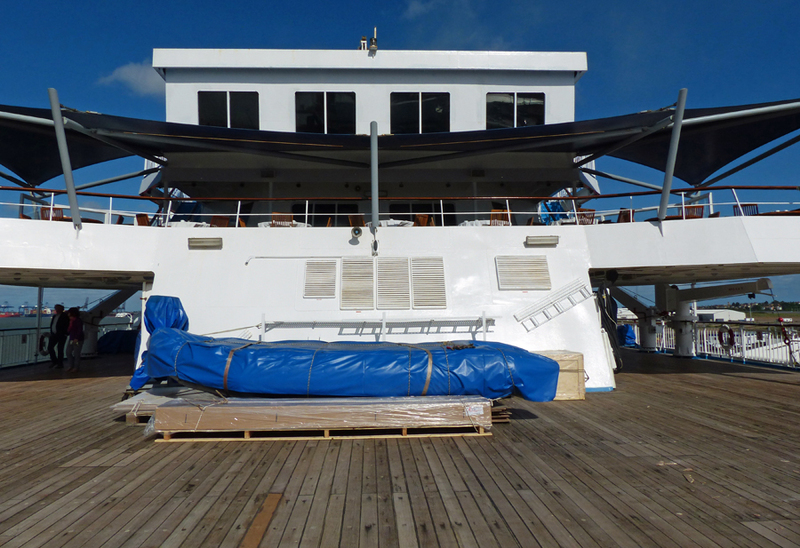 This can be reached through the Verandah restaurant, or by stairs from the rear of deck 6 below, or deck 8 above between the Sunset bar and the Fitness centre. The main part of deck 7, the lido deck, (actually called the Bridge deck), also has sea views but from behind protective perspex screening, so is better if you just need a view but don't like the wind. There is no access to the bows of the ship, but a view forward from the lookout lounge on deck 5 which is also where the Internet terminals are. Deck 8 also has a view forward, but is windy when the ship is under way. There was some talk among other passengers of not enough places to sit and relax, but I did not experience this. Admittedly the library is fairly small, and so was often quite full but there were always seats somewhere in one of the lounges. One problem with the library, which should normally be reasonably quiet so that people can read undisturbed, is that when they use the next door Scott's lounge for a presentation, the door between the two gets wedged in the open position. This means the P.A. is very disturbing. No matter how many times you get up to shut the door the next person through leaves it open again!! The main problem with the library is that it is the only route between the back and the front of the ship on deck 5. Several inconsiderate passengers think nothing of stopping here for a ten minute chat, sometimes with raucous laughter, if they happen to bump in to someone they have met before. There is an equivalent room on the port side but this is used as an overflow restaurant and the doors to the Scott's Lounge are kept closed. We also found some passengers in the library were in the habit of reading the clues to the crossword out loud and replying with the answer, which spoilt it for anyone else intending to do the days crossword later or who had only just started. They then thought it was unreasonable for others to complain about this. An advantage of this ship is that it is not far from one end to the other and nothing is far from one or other of the stair wells. There was certainly more room than on the Marco Polo. One problem with the design is that you have to go through the Darwin Lounge to get to the Lookout lounge. They have responded to previous complaints on this point by making a corridor along the starboard side, although you still need to be quiet when a lecture is on. Some inconsiderate passengers however still trundle through on the port side in the middle of a lecture, pushing the screen out of the way to get through. I even saw one person go through the Darwin lounge on the starboard side, completely ignoring the corridor. There are clear notices advising of this so there is no excuse, some people are just inconsiderate to others, fortunately mostly a small minority. The Darwin Lounge is used for lectures and shows, but unfortunately has a level floor rather than a raked one, which makes visibility for the shows a problem. There are three projectors (ceiling mounted) and screens so it is less of a problem for talks. The projectors appeared to need focusing (text on maps was very difficult to read) and one projector was in need of calibration having a distinct blue cast. The best seating is at the edge of the room (both sides) which is raised. Though even here the seating is not ideal as the largest area has "c" shaped settees, leaving some with their backs to the stage and screen. These seats tend not to get used and inverted "L"s, like the ones at the back, would have been a better shape. The raised seats that face the front are the most popular, offering the best view, but you have to get there early to get them. The two forward settees are the right shape but should be swapped port/starboard so that no one is left sitting behind the screens facing the wrong way. The ship is a little noisy, there was an irritating squeaky door that we could hear from cabin 4124 but could not trace. We later found a door in the bar of the Scott's Lounge on the deck above that made the exact same noise. There was also an intermittent pump that went off with no pattern, but normally only when under way. We have had the occasional slammed cabin door but not as regularly as on other ships. You soon get used to the noises. One disconcerting thing when first discovered is that they usually turn off the suction on the toilets overnight. It avoids disturbing noise during the night for light sleepers but could prove embarrassing if caught short and unaware. The cabin was the normal sort of cabin, but well laid out. The bathroom was small, particularly the shower (it is easy to turn off the water accidentally in mid shower) but adequate, and it is better to have the majority of space in the cabin. There was plenty of drawer and wardrobe space, we had space left over. It might be tight if you need to have clothing both for hot and cold climates. The suitcases slid under the bed, opened flat. Like many cruise lines visits to the engine room and kitchens are no longer allowed due to Heath and Safety reasons, but visits to the bridge were allowed. There were a limited number of places available and they were all quickly taken up. 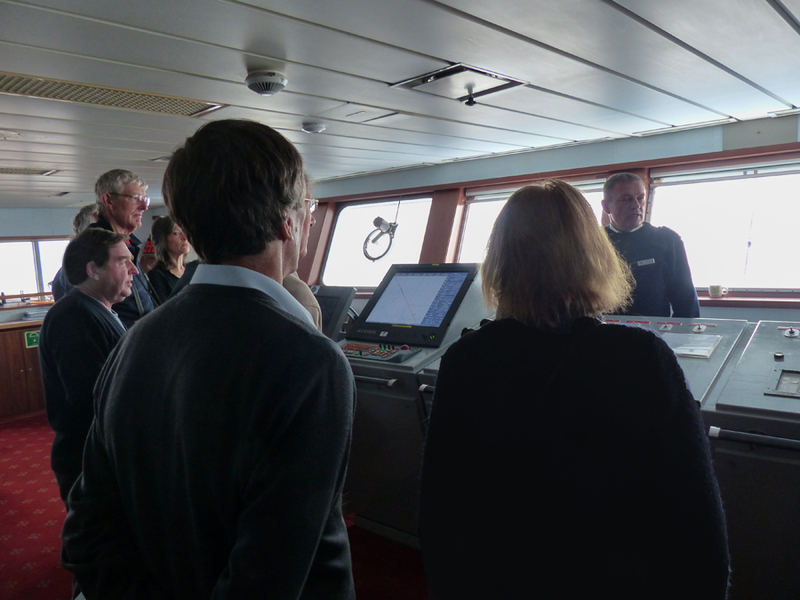 It was very interesting and everything was explained by the captain (with copious dry humour) and time was allowed for questions. As these had proved popular a second sea day later on had bridge visits arranged. Several passengers seemed to have a poor impression of the ship, saying it is not as good as the Discovery (now scrapped), yet many of these were repeat passengers so perhaps it the British disease of find fault with everything. The Discovery did seem to be universally popular, it is a pity she wore out. Some of passengers are a little weird. I have mentioned some that expect deferential treatment but are inconsiderate when it comes to other passengers. I have to mention two others though. The first was a woman who had booked on the wrong Voyager but didn't discover this until on board, but then was happy to confess this everyone. Fancy not checking the itinerary! The second was a gentleman who said he needed to cancel his excursion in Russia because his father was in MI6 and they wouldn't let him in when they looked at his passport. Why had he booked Russian excursions in the first place, and why come on a cruise to Russia? There are plenty of cruises that do the rest of the itinerary and just omit the Russian ports. This is very slow (it is not broadband) and not always very reliable (this is often the case in the arctic). There is a signal in the library but I did not see an access point (normally an inverted white cone on the ceiling), but there is one in the Scott lounge. Perhaps access would be better from there. It is fine in the Lookout Lounge. There was an Ethernet port in our cabin, but with no idea of the SSID it was not possible to connect. Maybe this is to come. Wifi does just reach some of the cabins when it is quiet, but the signal is very low and connection is not normally possible. However if you stay on board on excursion days and have set your wireless to connect automatically, it is perhaps safer to set your laptop in Airplane mode to prevent it from logging on and using up your time when you were not aware you were connected. Even if you do not open a browser, many software products open their own connection periodically to check for updates. Things seem to work fine on laptops but I-pads and phones seem to have problems with G-mail (both the ap and with Safari) but will work with Outlook. Reception seemed to know of this but had no solution. This is adequate for information but not very good for films. There seemed to be intermittent problems with the sound. I assume the films are shown from DVDs so this is a pity. There were some films on our "wanted" list but we chose to skip them and will get them later from Lovefilm. We did see one film in the Darwin Lounge as part of one of the talks and this was fine, but the Darwin Lounge had a full program so was not available for films. We look forward to being on the Black Watch again next year with its dedicated Cinema. There is no self service laundrette on board, something that surprised us as we have come to expect it. They do of course have their own laundry which can be used via your cabin steward.